A pioneering team of assistant practitioners created and led by a nurse consultant has been trained to meet the psychosocial needs of vulnerable adult patients attending the emergency department (ED) of Southampton General Hospital. The Vulnerable Adult Support Team (VAST) is providing interventions for a wide range of issues – including substance use, homelessness, sexual violence and human trafficking – in a service recognised as 'outstanding’ by the Care Quality Commission. ‘Southampton's VAST provides a cohort of specialist support staff (Agenda for Change bands 3 and 4) with knowledge, skill and time to address psychosocial need,’ explains consultant nurse Sarah Charters, who implemented the service. ‘They work alongside emergency medicine and liaison psychiatry colleagues to manage complex issues that underpin physical and mental health crises. ‘Before VAST, these underlying psychosocial causes of patients’ health problems were often left unaddressed by clinical staff due to lack of time, inadequate knowledge or experience, or infrequency of contact with specific issues or because staff lacked confidence to intervene,’ says Ms Charters. Interventions are delivered within a model of motivational interviewing. The team identifies psychosocial issues, completes risk assessments, provides information, delivers safeguarding interventions and signposts and refers to specialist and community services. 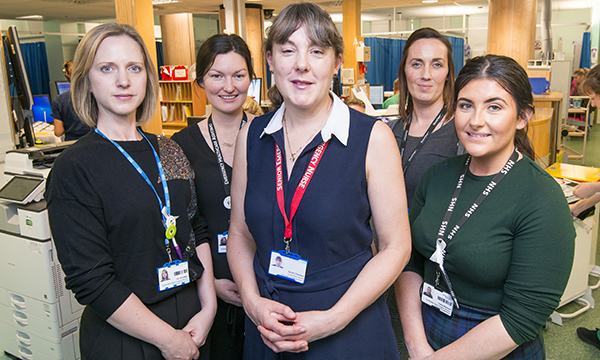 Sarah Charters and the vulnerable adult support team at University Hospital Southampton NHS Foundation Trust were among the finalists for the RCNi Emergency Nursing Award in 2018. The team addresses the psychosocial causes of the health problems of people attending the emergency department. It offers interventions for adult vulnerabilities, including domestic abuse, honour-based violence, substance use, homelessness, sexual violence and human trafficking. The VAST team also provides support to patients with dementia and learning disability, and their carers. Getting the service off the ground was a challenge. ‘The main issue was securing permanent funding, with three years of fixed-term funding until formal commissioning,’ Ms Charters explains. Tor Strowger was a healthcare assistant before joining VAST in January 2016 after three week’s training, followed by two weeks of shadow shifts with the two existing VAST practitioners. ‘There are professional development days every month when the team discusses complicated patients,’ says Ms Strowger. ‘We also invite experts from the community to come and talk about their services so we are aware of everything that is available. She says the team has a wealth of up-to-date knowledge and connections in the community that the medical staff would never be able to keep on top of. For example, one man attended the ED with a medical complaint, and while there disclosed that he was alcohol-dependent. ‘I went to speak with him and he declined to see me,’ recalls Ms Strowger. ‘I suggested that a quick five-minute chat would help pass the time while he was waiting for his blood results to come back. She referred him to a specialist alcohol clinic at the hospital. ‘This is not the usual place to refer someone, but with my extra knowledge I knew that this would be the most appropriate route for him. Clinicians in the ED report that now they are no longer drawn into managing complex and time-intensive psychosocial issues they have more time to provide clinical care, which improves patient flow. At first, says Ms Charters, some did not support the focus on psychosocial problems, believing it was the role of primary care and community services. She overcame this by following a rigorous model of ‘brief’ intervention, championing the ethos of making every contact count, demonstrating the benefits of the role in practice and through training. ‘Some of the fiercest critics have become our strongest allies,’ she says. ‘Evaluation has found that our well-trained and experienced team members provide complex interventions, supporting safe discharge plans for vulnerable patients,’ says Ms Charters. For consultant Chris Hill, the ‘absolutely vital’ team, together with Ms Charter’s passionate leadership, is crucial in meeting patients’ needs. ‘As we all know, there is a significant overlap between physical and mental health issues in many patients, especially those with complex social issues which affect their ability to receive effective care and treatment,’ Dr Hill says. Formal feedback from patients, ED staff and partner agencies has also been overwhelmingly positive. VAST has also transformed the ED’s relationship with community services, enjoying a close working relationship with more than 25 community agencies. ‘This has improved patients’ access to services and ensured they have specialist interventions earlier,’ says Ms Charters, who was made an MBE for her services to vulnerable adults in the 2018 Queen’s Birthday Honours. For example, the ED has the highest number of referrals of any agency to PIPPA, Southampton’s domestic violence charity, and 80% of the patients they refer engage with their independent domestic violence adviser (see box). For the VAST team, this impact is extremely satisfying. ‘I love coming to work and doing what I can to help people when they are feeling low or in need of someone to listen and understand,’ says Ms Strowger.